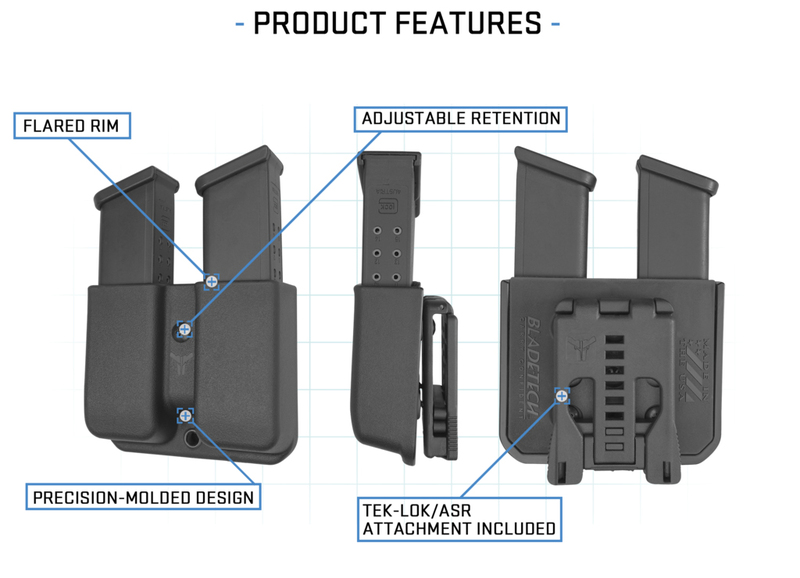 The Blade-Tech Signature Series Double Magazine Pouch is made of our Proprietary blend of Super Tough Polymers. Externally they have been textured to mimic the same hand crafted look and feel of our ever popular Classic Series. The top entry points are flared slightly for easier indexing and ultra-smooth re-holstering. The adjustable single retention point and internal ribs allow for precise tensioning to the desired friction level . These pouches are fully ambidextrous and designed to give a consistent fit with rounds facing both forward or to the rear. The Signature Magazine pouches are marked for specific fitments but please consult our Magazine fit chart as many of the pouch models fit multiple firearms magazines. Ideal for Daily Carry, Range, Field or Competition. Made and Assembled in The U.S.A. The Adjustable Stingray (ASR) Belt loop Features a movable belt shim to easily adjust sizing for various belt widths while maintaining a secure and close to the body Outside the Waistband fit. The ASR belt loop boasts a wide platform design to optimize stabilization on your belt. Flared entryway for smoother re-holstering.